It’s not how long you spend at a football club; it’s what you do when you are there. That adage sums up Greg Phillips’ fleeting four-season contribution to Collingwood during the early-to-mid 1980s. While he played only 84 VFL games for the club, he made a lasting impact on the teammates around him, and supporters who remember him fondly. Phillips was a hard-nosed, chunky, key-position defender who was always prepared to give his all, most notably when the Magpies’ back half was under siege. A big man on the field (almost 100 kilos) and a big personality within the playing group, he made his teammates walk taller when he was around them, and often left them smiling, such was his engaging personality. His equal-third placing in the 1985 Copeland Trophy – behind Mark Williams and Shane Morwood – highlighted his value to the team. But he was also a binding force in fostering camaraderie within the playing group as a practical joker and likeable character. One of his former coaches called him a “larrikin” who was popular with all of those who worked with him. Phillips had been one of the key recruiting targets of the New Magpies, the reform group which seized power in late 1982, promising to embark on one of the biggest talent acquisitions in Australian football history. Some made a difference; most didn’t. The audacious spree would push the club to the brink of bankruptcy, as it spent millions on transfer fees, salaries and costs. A South Australian, Phillips didn’t come cheap, either, but at least he proved an important player in his short time at Victoria Park. Phillips originally came from the small South Australian town of Minnipa, where his family ran a sheep and grain farm. He moved to Port Lincoln, 250 kilometres away, for schooling and for football, a pathway that ultimately led him to Port Adelaide in the SANFL. Phillips played in a losing SANFL grand final in his debut year of 1976 – against Sturt, the team he followed as a kid. He went on to play in four premierships in his first five seasons (1977, ’79, ’80 and ’81), impressing with his uncompromising attack on the ball and his ability to read the play. He was an All-Australian in 1980 and won the Fos Williams Medal for best afield in South Australia’s clash with Western Australia at Subiaco in 1982. Phillips planned to play out the last year of his contract with Port Adelaide before making a move to the VFL. But he opted to fast-track his move when his Port coach John Cahill took on the senior job with Collingwood for the 1983 season. Cahill wanted his dependable defender alongside him at Victoria Park -he rated him the best centre half-back in Australia – and set a move in motion to get the 24-year-old to Victoria. Port Adelaide wanted to hold Phillips to the last year of his contract, and took Supreme Court action in an effort to thwart the transfer. In the end, the action was settled out of court, and Collingwood was forced to pay out a reported $300,000 to get their man. Phillips took on the No.3 jumper and played his first match against Carlton at Waverley in Round 3, 1983. He had 20 disposals and made an immediate impact, even if his first kick landed in the arms of Blue David Glascott. Quickly, ‘Flipper’, as he became known, established himself as a no-fuss, no-frills, uncomplicated defender. He managed to keep his Port Adelaide nickname ‘Kutchie’ under wraps from his new teammates. The Port players called him that when he arrived at the club as a teenager, with ‘Kutchie’ derived from ‘Kutchie, Kutchie Coo’, given his youthful look at the time. His importance grew when Bill Picken left for Sydney at the end of the 1983 season, a debut year in which Phillips played 20 games. Phillips quickly became one of the most popular clubmen of the time. He didn’t mind a drink or a chat, was part-owner in a racehorse called Magpies’ Hope with Tony Shaw and Darren Millane, and was renowned as a practical joker in the rooms. 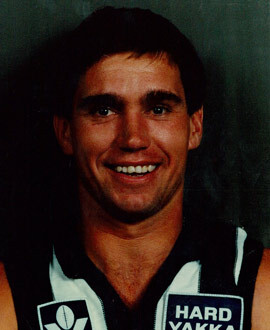 He was a member of Collingwood’s 1984 finals series, playing 22 games that season, and had his best season the following year when running third in the best-and-fairest count. Phillips only planned to stay at Collingwood for three seasons before returning to Adelaide with his young family. However, he loved it so much – even though Cahill left at the end of 1984 – that he played on until the end of 1986. It proved a tough year for the club on and off the field. Bob Rose handed over the reins to Leigh Matthews as coach after three rounds and Collingwood’s financial meltdown meant the players had to take a 20 per cent pay cut to help keep the doors open. Phillips had no issue taking a pay-cut and also appeared in television and newspaper advertisements for the club, alongside stars such as Tony Shaw, Mark Williams and David Cloke. Phillips never got to taste the ultimate success at Collingwood, but on his return to Port Adelaide, he went on to play another seven seasons for four more flags (eight in total) in the SANFL. He contemplated joining Adelaide when the Crows came into the AFL in 1991, but his loyalty to the SA Magpies won out. He ended up playing 343 games with Port Adelaide, and if you add his 84 VFL games and his 20 state games, he carried his powerful frame through 437 senior games. But his retirement at the end of 1993 didn’t end his family’s connection to the game. One of his daughters, Amy, married Shaun Burgoyne, who also made premierships an art form with Port Adelaide and Hawthorn, and another, Erin, not only represented Australia in basketball, playing so successfully in the WNBA, but has been one of the stars of the AFLW juggernaut. When Erin and the Crows won the inaugural 2017 AFLW premiership, and she won the first AFLW MVP award, the typically understated Greg Phillips called it his greatest moment in football.